Handheld games are traditionally a solitary affair. Multiplayer gaming is generally left to consoles through couch based local play or online along with their PC counterparts. We’re usually left out and it’s not often that we get games that use the multiplayer capabilities that the Vita offers through its capacity for online and ad-hoc wi-fi networking. The title is rather misleading however, as it’s not a true party game as you might expect. In reality Vegas Party can be best described a a board game with integrated casino themed mini games, like WizardSlots, set in a Last Vegas inspired environment. There are three game modes, although two are cut down versions of the main one so I’ll focus on that. 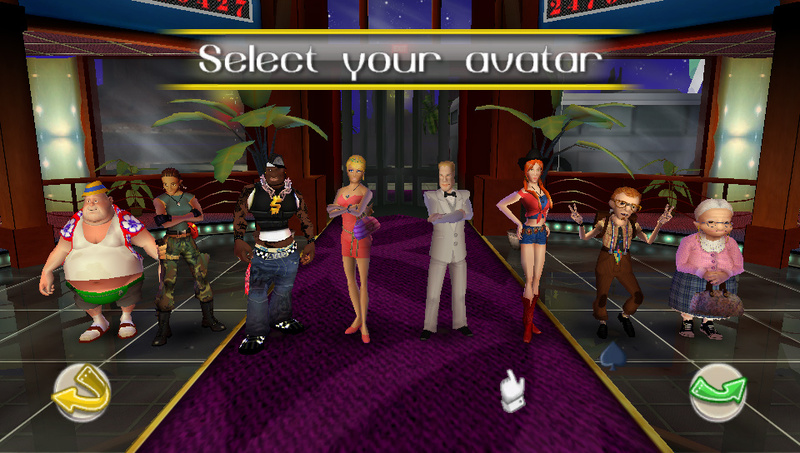 The main mode is The Strip – the board game element that puts you in control of an avatar (from a choice of eight) traveling along a section of Vegas (the board). There are four players taking part and the winner is the one to reach the end first. 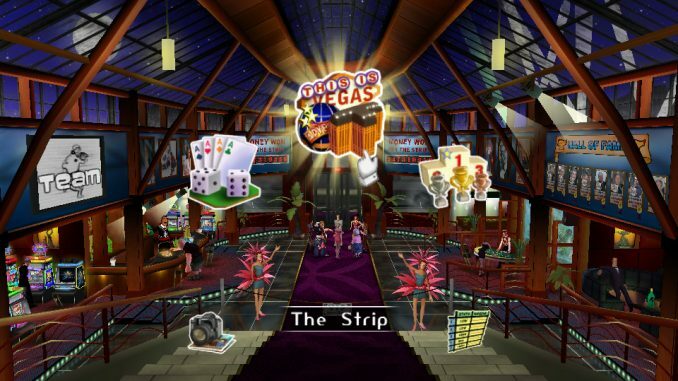 Along the way are casinos to visit to earn cash, hazards, squares to give you bonuses… All the usual pitfalls and rewards you would expect from a typical board game. To move, each player rolls a die at the start of their turn and moves to the corresponding square and follows the appropriate instructions. 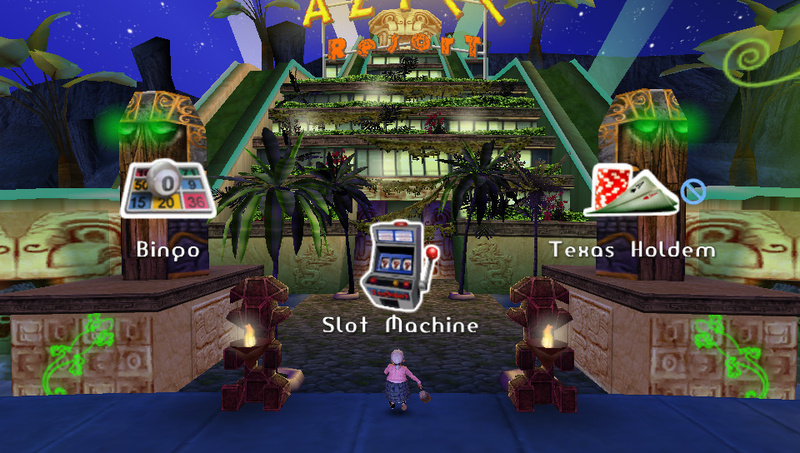 If the player lands on a casino square, all four players head to that casino to play a mini game to earn cash and bonus moves for their next turn. In theory this is where the game should have really shone but sadly it’s where the gameplay fell flat. There are ten different casino games represented here including familiar and not so familiar games but each has been dramatically simplified for Vegas Party. When whisked off to each casino, a game is chosen at random and spread over three or four rounds and you are allowed to make a nominal bet on each. The games are played with an emphasis on speed and simplicity rather than adhering to the rules of the games they are based on so plenty of liberties are taken. 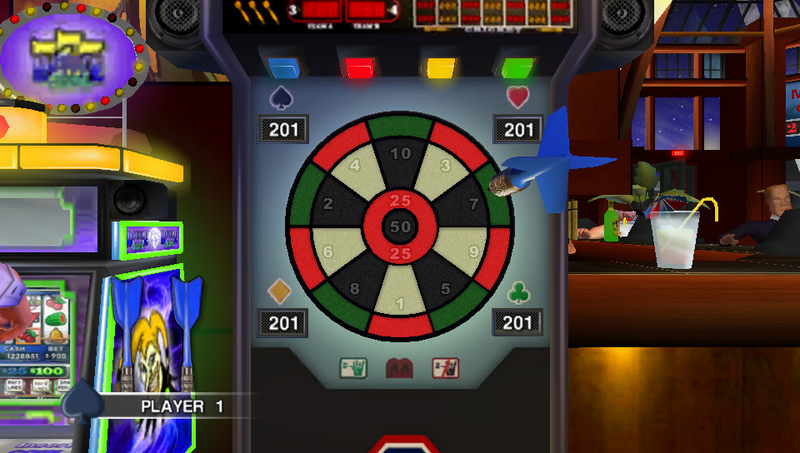 The Darts game, thanks to the frustrating control system, feels like an exercise in random luck than anything else as do a lot of the games on offer. The one I was the most disappointed with was Texas Hold ‘Em. I’ve been a fan of this variation of poker ever since I first saw it televised years ago on Channel 4 watching tournaments and live cash games and moved onto buying and enjoying the World Series of Poker games on the PSP and PS3. However, here the game has been reduced to a mere shadow of itself. 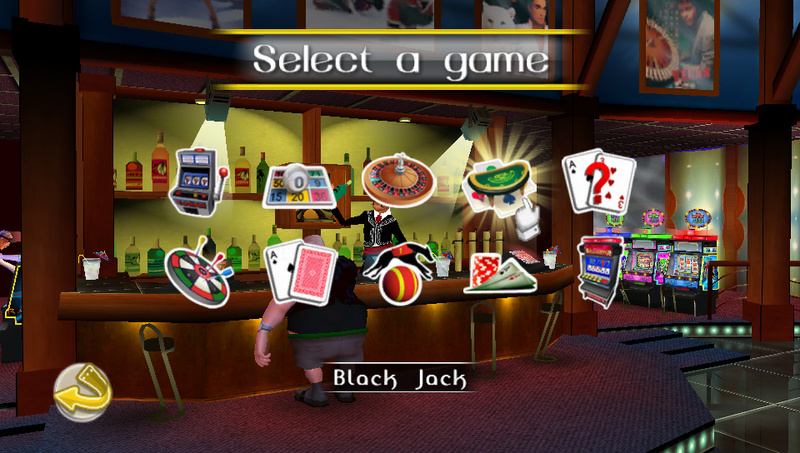 Players select their opening cards from a 3×5 grid that are briefly displayed (think memory match game) and only a single bet is allowed. No tactics, no strategy, no bluffing – it’s just a straight hand vs hand game and there’s very little excitement to be had. 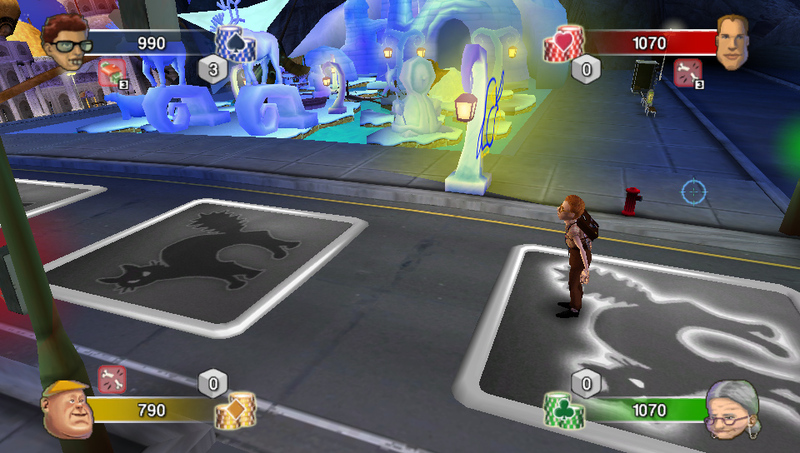 And sadly that is the strongest of the mini games and that highlights the main weakness of Vegas Party. I said that there were four players that take part in The Strip game mode but that isn’t exactly true. You see, Vegas Party is a single player game, or at least it is on the PS Vita. Yes, you read that correctly. Funbox Media have done the unthinkable and created a one player party game. 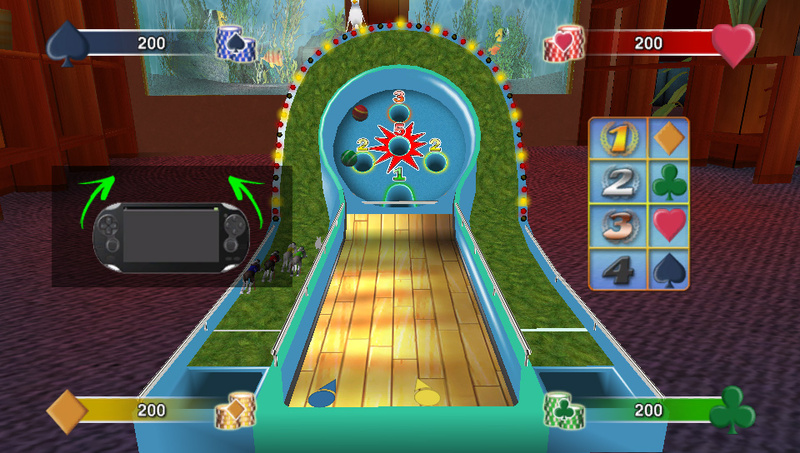 Most of the mini games require all the players to interact simultaneously with each other so rather than offering the option for online or local multiplayer via ad-hoc connection, Funbox have chosen to leave us with a single player title. Playing this makes you feel like the lonely child with a copy of Monopoly controlling all the pieces and the bank. Once or twice is bearable for a game like this, but games of this nature are meant to be a sociable affair shared with friends and family. I’d probably say simplifying poker suffers the most here as – by its very nature – it’s a game centred around interacting with others. Home versions have managed to do a good job at recreating that, certainly in recent years and even when money doesn’t change hands the excitement has still been there because it has felt like you’re challenging someone directly. Taking those games online, again for fun, made them even better (I lost count of the amount of time I did that using the now defunct PlayStation Home on the PS3) or for that genuine experience, against a real player head to head through any of the poker sites out there online. Here? The games are over all too quickly and hardly feel worth playing, and even when you do win anything you never get a sense of achievement, let alone the smugness of being able to beat your friends! As a game this is a bizarre hybrid. It doesn’t seem to know if it’s meant to be a board game or a casino game throughout but it lets the player down on both fronts. The board game aspect is bland and drawn out offering very little in the way of excitement. The different perks and penalties that are imposed on players as you land on squares during play neither frustrate or delight leaving you bored while you wait for the mini games to come around and take place. Even rolling the die seems to take forever and moving around the board is dragged out as the characters traverse the board. They jump and hop from square to square in animation which wouldn’t seem out of place in an archaic 16-bit game and the entire playfield scrolls from one player to another slowly on every turn. Once or twice would be fine to “take in the view”, but having to go through this continually throughout the game becomes tiresome. There’s no quick way to move from player to player to speed the game up and it feels like it’s another mechanism to draw the game out more. The movement system – which had the potential to be quite original – actually makes the game increasingly monotonous. As each player is assigned movement points it’s possible to spend several turns moving backwards rather than forwards depending on penalties awarded during play around the board. This actually has the effect of prolonging the game more with some players repeatedly retracing their steps over a small section of the strip… You could end up moving backwards through no fault of your own and spend half of the game sitting around doing nothing again leading to boredom. There’s very little to actually to do in the game beyond playing the mini games and for a digital board game that really isn’t good enough these days. Moving backwards and forwards for what feels like an eternity isn’t my idea of fun – I’d liken that to Chinese Water Torture instead. There are two other game modes on offer but these are simply variations of the main game. 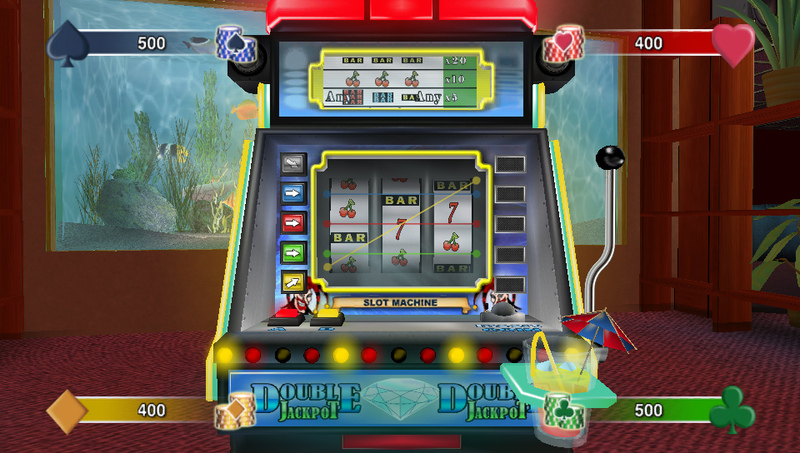 The first allows you to select mini games individually to practice and the second lets you play through all ten sequentially against three computer opponents to try to get the highest score possible. I don’t actually know what mode is less appealing but with each mini game lasting only a minute or two, you won’t really be returning to these modes more than once or twice. Ignoring the gameplay and looking at it from an aesthetic point of view and even that disappointed. Graphics are bland and offer very little personality both in terms of the character animation or definition. The backgrounds seem to be relatively lifeless and generic and there’s nothing really with that “wow” factor that you’d expect from the Vita. Sound is run-of-the-mill and the end celebratory music is nothing short of diabolical lasting just a few short seconds before looping (badly). Throughout. the presentation shows a severe lack of polish as if the game were rushed out to meet a sales deadline. I can’t continue without mentioning the abysmal control system. 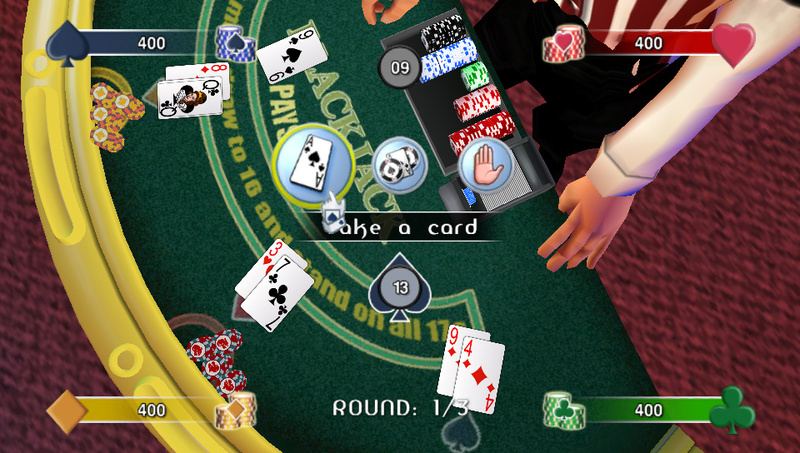 Most of the game is controlled using an on-screen cursor (a hand with a symbol on it representing one of the four suits of cards – not easy to distinguish on the Vita’s screen when several are on screen together). This is controlled using the left analogue stick with X to select BUT movement is also controlled by tilting the Vita so even the slightest nudge will move your cursor. There’s no options menu so you’re forced to have both control systems in play throughout and the motion system is cumbersome at best. This would be bad enough in itself but one of the games can only be played using the motion controls and to be frank is just unplayable. Where this game really fails is the lack of a multiplayer function. I haven’t been able to test this on the PlayStation TV yet to see if it has been enhanced for the micro console as many other games have, but my gut instinct is telling me that it is still a single player only title. It would have been so easy to have added multiplayer functionality and that could have lifted this game to at least a mild degree of playability but as it stands it just just doesn’t warrant a purchase. The PS4 version does offer local multiplayer gameplay and despite the restrictive nature of each of the mini games at least this would have helped to extend the playability somewhat on the Vita. Because of the fast-paced mechanics used in each game a turn based approach wouldn’t have been possible but this certainly could have been done easily enough via an ad-hoc wi-fi link. In fact, apart from the simplicity of each of the games, this is the biggest problem – it’s a party game for one person making it the most antisocial party game ever released! This truly is a dreadful game and has no redeeming qualities. I hate being negative about games – any games – when I review them simply because I appreciate the amount of time and effort that developers put into creating them and no matter what the end result is, I’m sure that no-one sets out intentionally to create a BAD game but in this instance I really can’t find a single thing to say that is positive about Vegas Party other than the fact that it’s another physical release for the Vita. One to avoid at all costs.